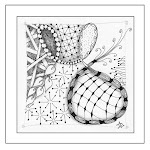 This is a fantastic piece of Zentangle Inspired Art - love it! Beautiful work and the colors are wonderful! I might actually get the hang of acknowledging comments on my blog - I have such an aversion to techie things but I love hearing from people! You both inspire me as well. Beautiful use of color... I love the addition of red to this ZIA. Very wonderful piece of art. Beautiful?